There's more than meets the eye in Apple's new Messages application for iOS 7, with a few key features hidden away, some of which are only accessible with touchscreen gestures. In previous versions of iOS, Apple only provided users with the occasional timestamp in its Messages application. The reason for this was easy to see: By only showing a time sent or received for certain messages, Apple was able to reduce onscreen clutter while still giving users relevant data. 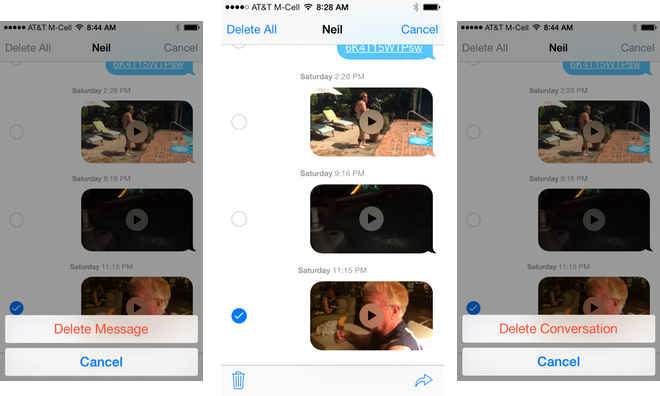 The company has employed the same approach in iOS 7, but has given users the ability to check the timestamp of each individual text, picture, video or iMessage with a hidden feature: By swiping your finger to the left and "pulling" the messages over, a complete list of timestamps for individual messages can be viewed. Also hidden beneath the surface in the iOS 7 Messages application is the ability to delete individual text messages. While a dedicated "Edit" button was visible in previous versions of iOS, starting with iOS 7 that button has been removed, allowing quick access to what is likely a more useful "Contact" button. By selecting the second, the screen layout becomes modified with a series of new options. Check-able circles are now available to the left of each individual message, allowing users to select a number at once. On the bottom of the screen are two icons: a trash can on the left for deleting the selected messages, and a Share Sheets link on the right for forwarding the selected messages. When in "More" mode, the top of the screen also adds a "Delete All" option for quickly clearing a conversation. Users can also back out of the mode by selecting "Cancel" in the upper right. Finally, users who upgrade to iOS 7 may notice that by default, when a conversation is open in Messages, only the recipient's first name is displayed. This can actually be changed and customized in the "Mail, Contacts, Calendars" section of the iOS Settings application. Under "Contacts," simply choose "Short Name" to access another menu. From there, the shortened name option can be enabled or disabled. If it's turned on, users are presented with a range of options: first name and last initial; first initial and last name; first name only; or last name only. 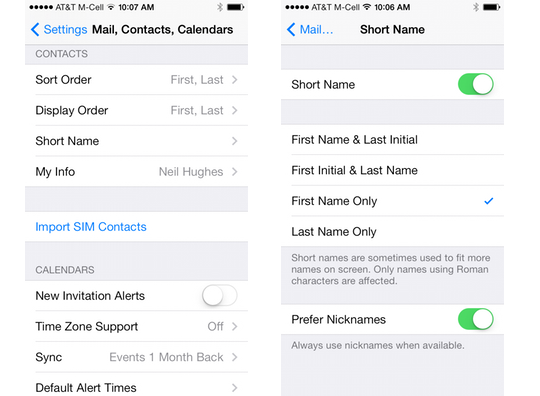 An option to prefer contacts' nicknames is also available to toggle. 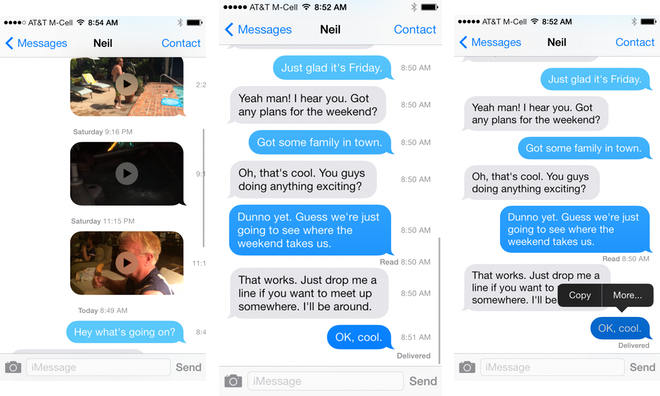 For more, see AppleInsider's Inside iOS 7: Messages. Highlighted capabilities of Apple's new mobile operating system are also being detailed in the ongoing iOS 7 feature focus series.